Sequoia Capital has invested USD 15 million Girnar Software, a software services and product development company based out of Jaipur. Although, the numbers are not official, as per ToI, Sequoia is expected to have 20 percent stake in the company, which will value 5 year old company at over USD 50 million dollars. Girnar Software owns Cardekho, one of the India’s leading auto portal gets 3 million unique visitors a month. Their other portals include pricedekho.com, an online product price comparison platform and Bikedekho.com, a portal that is exclusively dedicated to two wheeler information and comparisons! Girnar Software was founded by 2 brothers Amit and Anurag Jain both IIT-Delhi Alumnus. Indian online fashion store, FabAlley that is specifically focused on Women apparels and accessory store has raised undisclosed amount of funds from Indian Angel Network. FabAlley was started by Shivani Poddar and Tanvi Malik in 2012 with a singular focus of offering globally trendy apparel and accessories, which are all designed in-house. Tushar Singh from IAN will join the board post the deal. FabAlley is slightly different from regular online apparel and accessory store – For one, they are purely focused on women and secondly the site actually makes suggestions based on style requirement of shoppers. 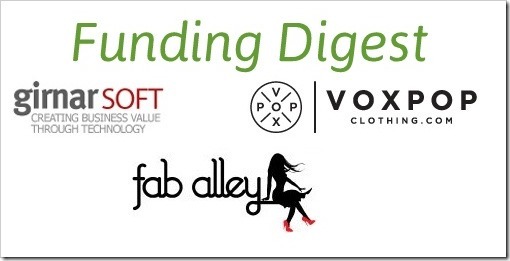 Superhero Based design online apparel store Vox Pop Clothing has raised USD 400,000 from Blume Ventures. Apart from Blume, other investors from US and India also participated in the funding. Vox pop clothing is a young startup launched in September of this year, designs and develops limited edition T-Shirts that are based on Movie and Television series characters. The have a license to use characters from production houses like Marvel, DC Comics, Disney and Star Trek. Vox Pop Clothing not only sell their merchandize on their own site, but also have storefronts of ebay, Flipkart and Jabong. Vox Pop Clothing was founded by Siddharth Taparia, a alumnus of Harvard Business School. There have been host of other sites with similar offerings, but what differentiates Vox Pop is that they are themselves creating and manufacturing designs that are quite unique. Also, they are not relying solely on the business generated on their store-front, but are distributing their apparels to other ecommerce sites as well!